For some time, I’ve wanted to learn more about Android. Not just theory, or second hand knowledge. I wanted my own, direct, practical knowledge – obtained by using an Android device “in anger” (as the saying goes). Playing with a device for a few minutes – for example, at a trade show – fails to convey many of the real-world strengths and weaknesses of that device. But it’s the real-world strengths and weaknesses that I want to experience. It’s also important for me for personal productivity reasons. If an Android phone turns out to be a smarter phone than any I’ve been using so far, I want to know about it – so I can use it more often, and become a smarter person as a result. But there are sooo many Android devices. Carphone Warehouse had a large selection to choose between. For a while, I struggled to decide which one to pick. For help with a Nexus One, I owe a big debt of gratitude to Kenton Price of Little Fluffy Toys Ltd. I first met Kenton at a recent meeting of the London GTUG (Google Technology Users Group), where we both listened to Google’s Wesley Chun give an upbeat, interesting talk about Google App Engine. Later that evening, we got talking. A few days afterwards, Little Fluffy Toys became famous, on account of widespread publicity for their very timely London Cycle Hire Widget. Kenton & I exchanged a few more emails, and the outcome was that we met in a coffee shop next to the Accenture building in Old Bailey. Kenton kindly leant me a Nexus One for a few weeks, for me to find out how I get on with it. Just as important, Kenton quickly showed me a whole raft of fascinating things that the device could do. It was the transfer of all my “phonebook contacts” from the E72, to be merged (apparently) with my email contacts on the Nexus One, that gave me even more reason to hesitate. I wasn’t sure I was ready for that kind of potential restructuring of my personal data. So I’ve compromised. I already have two SIMs. One lives in my E72, and the other usually sits inside my laptop. 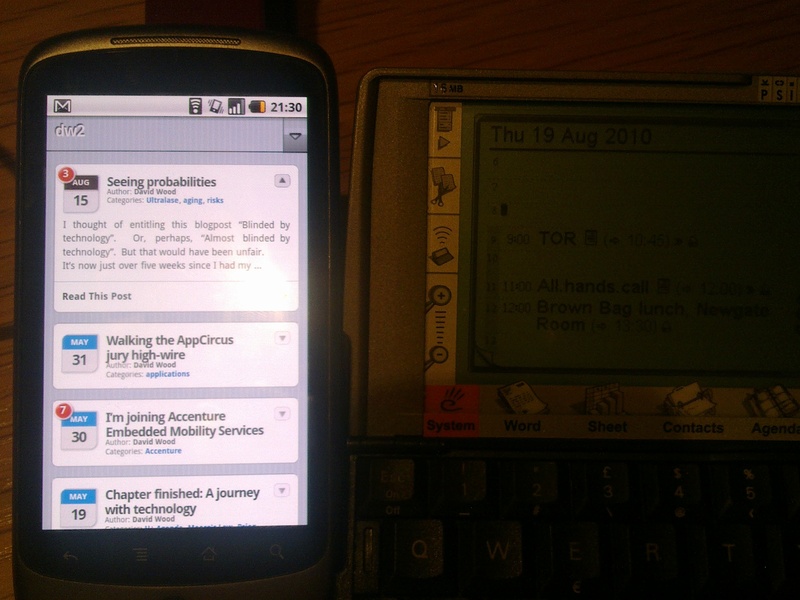 Well, I’ve taken the SIM from the laptop and put it into the Nexus One. For the time being, I’ll keep using the E72 for phone calls and text messages. And probably for lots more too. But I’ll use the Nexus One for lots of interesting experiments. (Like showing friends and family members Google Goggles…). I expect this usage pattern will change over the weeks ahead. Let’s see how things evolve! I picked up my HTC Desire at the weekend. My old phone is a Nokia N73. I fully charged the Desire this morning at work and the indicator is down to half at 15:00. The Nokia can go for a day or two without charging. I am dissappointed that there is no MMS and no universal inbox on the Desire. Apparantly Softbank will release an MMS app soon. So that’s 3 different messaging applications. Also, the messaging app (for SMS only) is difficult to use. My second call today broke up and I was reduced to sending an SMS instead. I have had a Nexus One for a while now and despite the battery levels I love it. It is the best phone I have ever had, including all the Nokia ones 😉 It does what it is supposed to do nicely, it is usable, the UI gives constant feedback of what it is doing, the GPS works always, regardless of whether you are inside a building or outside (assisted GPS works) and I can deal with my email easily on the go. Ah, it hasn´t crashed on me a single time since I bought it. I had a problem once with the 3G connection because I installed a dodgy app to be able to manage it, but since I found a better one (it saves some battery), I am happy. I recommend you to use Task Manager (Rhythm Software) to kill the apps you don´t use and use Toggle Data Widget (Cameron Murphy) to switch off your 3G when you are close to a wireless network. This will help you save battery and will give you the ability to choose the network and apps you want to run. I think it’s the law that all photos of a Nexus One have to have the battery indicator fallen out of the green 😉 I think to appreciate the full power of contacts always backed up between phone and gmail/Google Apps mail over-the-air with no synchronisation required on your part, you do need to take the plunge with your contacts – you can un-plunge later – use the Nokia software to export to CSV, then import them to gmail. Then in gmail, do that thing where you merge separate contacts into one. Select full integration of facebook and twitter too – this is amazing on 2.1+ devices. I think the freakiest thing I yet saw was I dialled a number from a friend-of-a-facebook friend directly from the facebook app. No reply. Five minutes later, the contact called back… and his photo came up with his name as caller ID. The phone had automatically pulled his name, photo and contact details and made a contact from it. I look forwards to seeing what you conclude about android. funny thing, as i ended up with the same solution as you. with the difference that i own e71, not e72.